I understand why we use these phrases. There are times when you are preaching a Gospels text and you want to underline the fact that Jesus fully entered into our world and experience (albeit without sinning), so the first phrase is used to highlight some aspect of the true humanity of Christ. There are other times when we preach something in the Gospels and we want to underline that this isn’t “just” a human, but he is also God. God the Son did step fully into our world via the Incarnation and this is a glorious truth, but I suspect the introductory phrase often undermines the fullness of the union. That is, Jesus is fully God, fully man, and fully one. But often we can give the impression it was a 50:50 split. That is, look at the human side, then later, let’s look at the divine side. Let me give an example that will hopefully help. Yes, we do see Jesus’ humanity as he sheds tears of compassion for a shepherd-less people, anticipates the agonies of Calvary, or is stirred by the sheer wrongness of a funeral. 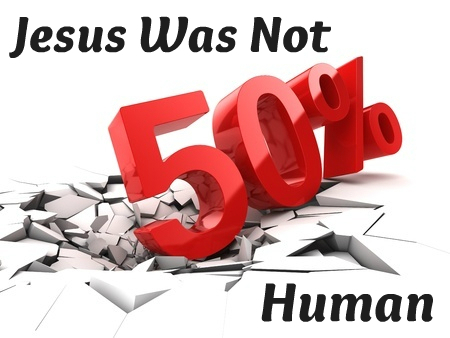 We see Jesus’ humanity in every episode of the Gospels. But we also see Jesus’ divinity in each one too. Jesus told his slow to believe disciples that if they had seen him, they had seen the Father. I think I am slow to believe too. Here I am, two millennia later, still falling into wrong assumptions about God the Father, despite reading the Gospels so many times. When we see Jesus feeling compassion for the crowds, in Matthew 9 or Mark 6, we are seeing God’s heart for the people. If you see Jesus, you see the Father revealed. When we see Jesus feeling the weight of what lay before him at the cross and in separation from perfect communion, we see the heart of God revealed. When we see Jesus respond in both empathy and anger at the death of Lazarus, God’s heart is shining out for all to see. If you see Jesus, you see the Father revealed in him. But when we use the introductory formula, “in his humanity…” then we can inadvertently hide the Father. Jesus, in his humanity, is feeling … but the Father remains aloof and unmoved, without passion, compassion, anger, empathy or true love? And before we know it, without even saying it, we have reinforced the traditional view that the true essence of God is completely opposite to all we know and experience, and therefore God is really out of reach. We should think long, hard, and biblically, before we choose to stay there theologically, or imply this homiletically. John 1:18. John 14:8. Colossians 2:9. ← Preparing Christmas Sermons or Advent Reading?